I love Vegas but I don’t love masses of humanity in my way. I’m a New Yorker and always in a rush even when I don’t have somewhere to be. The Vegas Strip is already too crowded with slow walkers and tourists just stopping for no reason. Blech. 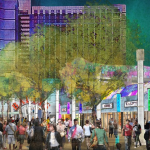 As details about the Grand Bazaar Shops in front of Bally’s continue to emerge my desire NOT to be near that part of the strip grows too. 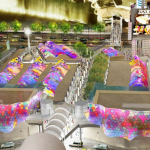 You may know that from a blog post from last year about the Grand Bazaar Shops. 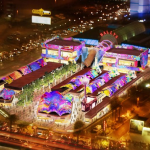 Vegas Chatter dug up some of the fancy flea market vendors that will be at the Grand Bazaar Shops and they’re exactly what you might expect from a flea market – jewelry, handbags, sunglasses and other stuff you’d find at a rest stop in New Jersey. 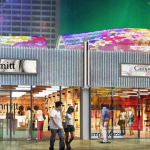 Check out these hideous renderings of the Grand Bazaar Shop. On a side note, who let Caesars artists into a Bellagio to sketch that point of view? While people stop on the, already crowded, Vegas Strip to look and decide whether or not to check out the “stores” they’ll just be in standing in the middle of the sidewalk clogging traffic. 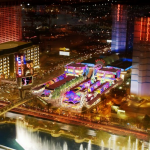 At least the Park area in between Monte Carlo and New York-New York and The Linq are designed to draw people away from the Vegas Stip. The sidewalks can’t be widened because there’s already too much car traffic on the Vegas Strip so the human traffic will only get worse. The only way to avoid traffic in the middle of the strip is to avoid it. Thankfully Delano Las Vegas at Mandalay Bay will complete renovations soon. Some of the hotel rooms at Delano Las Vegas are already finished. We should expect the public spaces to be completed on time. 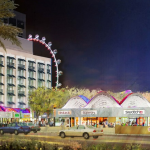 SLS Las Vegas is working 24/7 to ensure that they will be opening at the end of summer. Both of these hotels on opposite ends of the Vegas Strip give a good excuse for someone like me to avoid the middle of the crush of people in the middle. I understand that not everyone is like me. There are people who actually like to do things other than eat, drink and gamble when they’re in Vegas. GASP! I understand the Vegas Strip’s need to evolve but I’m happy that there will still be new hotels and casinos for people like me to enjoy. 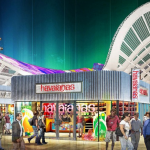 Learn more about the Grand Bazaar Shops here.